Scrub it from top to bottom. Bathrooms tend to feature a lot of chrome and porcelain, on which dirt, fingerprints and soap residue are really noticeable. Remove everything from the counters and sink area so you can thoroughly clean. Clean mirrors, the toilet, the shower and the inside of medicine cabinets, along with any under sink cabinets, closets and storage areas. Also, polish chrome fixtures so they sparkle. Get rid of unused stuff. Bathrooms are where all sorts of things pile up: medications; neglected, half-used bottles of shampoos; tubes with toothpaste and lotions; hairspray cans; deodorants; hairbrushes, etc. Throw out things that aren’t being used and clean the containers you need. Keep counters, the sink area and the shower area clear of anything that isn’t used regularly. Keep cabinets and drawers organized so that you can show off the bathroom’s storage space, as well. Look at the walls. 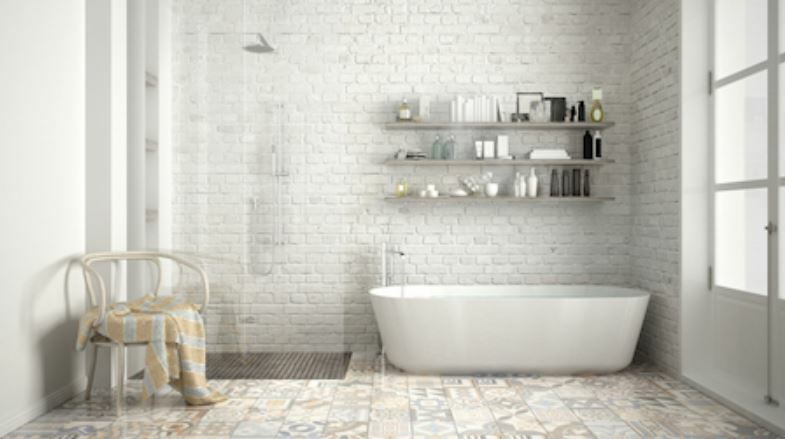 Bathrooms get humid and steamy, which can lead to condensation. This can affect the paint and can even cause mold if the room isn’t properly ventilated. Clean the walls thoroughly and consider a paint job if needed. If you do see any signs of mold, call a professional. Also, be sure to vacuum out dust that may have accumulated in any heating vents and remove and clean the light fixture cover. Keep it fresh. An air freshener can help keep the bathroom smelling fresh, but choose a scent that isn’t overwhelming or smells too much like a cleaner. If the weather is suitable, open the window. Lighting candles while people are looking at the house can leave a room smelling nice while adding an elegant touch; however, make sure candles are in areas where they can’t be knocked over and give them a quick inspection after visitors leave. Clean the toilet. Since it is one of the most prominent features of a bathroom, thoroughly clean it inside and out. And clean the floor area surrounding it, too. Put a little elbow grease into the area behind the toilet because dust can accumulate there. Replacing your toilet seat is simple, affordable and can freshen up the room. Make the shower sparkle. Clean the tile, the tub area, the shower head, the faucets and the temperature knobs. Also, be sure to clean soap dishes and your shower shelves. Thoroughly wipe down shower doors. And if your shower has a curtain, invest in a new one.